Hi Miss Heather! On my way home yesterday (7/22), I noticed the new taco establishment on Driggs was having its “soft opening.” I didn’t jot down the address but it’s between Eckford and McGuinness in the site of the bodega that was there. I’ll be going back to try the rice and beans and corn on the cob (veg options). It looks promising — large place, new wood floor, clean decor — and good AC! The friendly guy behind the counter told me he is from Carroll Gardens and is friends with the previous bodega owner. I thought you’d like to know about this one! Although I learned about this most auspicious development from Jay earlier this month, I suspect I speak for the vegetarians in our fair burgh when I write that I am very pleased they have fare on their menu for us. I for one am very eager to hear Monika’s review! 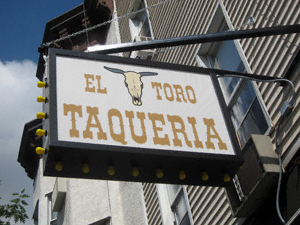 *Whoops, make that El Toro Taqueria!